In May, Orange County Government will observe Building Safety Month, in conjunction with the International Code Council (ICC) by hosting a series of events and educational opportunities for the community. All communities need building codes to protect their residents and infrastructure. Thorough building codes, adopted and enforced by well-trained professional code officials, are the best way to protect building structures in the community. Orange County’s Division of Building Safety invites its valued partners to the following free events in the atrium of the County’s Administration Building, 201 S. Rosalind Ave, Orlando 32801. The final event, concluding the month-long initiative, will be held on May 30 at the Orange County UF/IFAS Extension Education Center in Conway. Friday, May 4 | 9 a.m. – 3 p.m.
Meet-and-greet with Orange County building officials and partners featuring giveaways, refreshments and fun. Visit the event page to register. Tuesday, May 8 and Thursday, May 10 | 9 a.m. – 3 p.m.
Orange County Division of Building Safety will offer free training and a demonstration of Fast Track Online Services, with several sessions each day. Sign up and learn about Fast Track Online Services, how to submit plans and apply for permits electronically. Visit the event page to register. Friday, May 18 | 9 a.m. – 3 p.m. Learn about Orange County’s Office of Emergency Management and the steps to prepare for disasters and response operations. Presentations will be provided by personnel from Orange County’s Office of Emergency Management, The Home Depot, Lowe’s Home Improvement and Publix Super Markets’ emergency management teams. Visit the event page to register. Monday, May 21 | 9 a.m. – 3 p.m. Learn about Orange County’s sustainability initiative and how the community can increase safety and reduce environmental impact together. The presentation will be provided by Orange County’s Sustainability Committee. Visit the event page to register. Wednesday, May 30 | 8 a.m. – 5 p.m.
Join us for a workshop at the Orange County UF/IFAS Extension Education Center lead by master code professional John Farinelli. Participate in educational presentations and licensed contractor training to earn free continuing education units. There will be food trucks, vendors and entertainment on-site. Visit the event page to register. 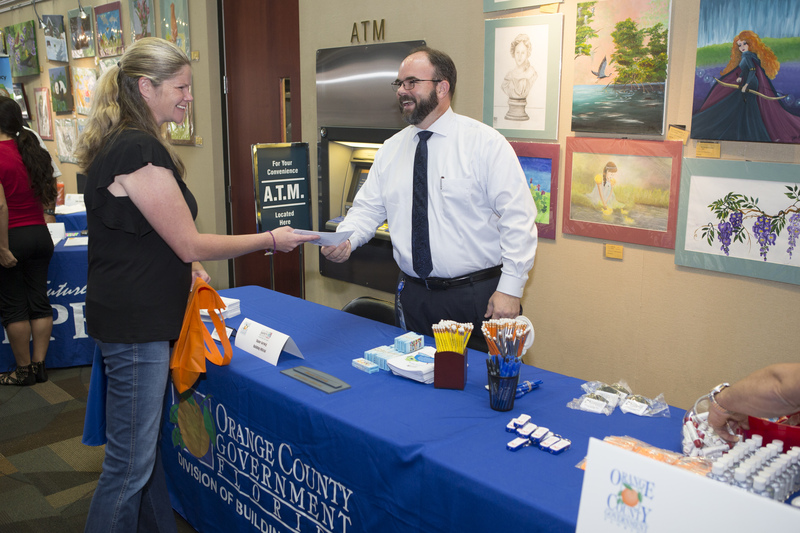 Photo Caption: Orange County Building Official Shane Gerwig greets a guest during Building Safety Month at the 2017 Customer Appreciation Day.